The supplementary practical exams 2014 of BA/ BSC (pass) Psychology part 1 & part 2 will be organized by University of Karachi on 5th and 6th of May 2015 in the Department of Linguistics, KU. MBBS (final professional) supplementary exams 2014 schedule has been issued by Karachi University. According to the KU, 4th to 11th May 2015 is the schedule of MBBS final professional supply exams 2014. 11th May to 16th May 2015 is the schedule of annual practical exams 2014 of BP.ED part 2 which will be held under University of Karachi. This entry was posted in Date Sheet, Universities on April 30, 2015 by admin. MPhil and PhD programs have been started in the department of public administration but in two other departments of Faculty of Management & Administrative Sciences, which are business administration and commerce, the programs of MPhil and PhD could not be started. Dr. Danish Siddiqui and Dr. Tahir Ali are the chairmen of departments of Business Administration and Commerce respectively and it is said that both of them are not interested in the start of MPhil and PhD programs in their departments so that they can maintain their positions for as long as possible. The MPhil and PhD programs have also been started only after the pressure of VC Karachi University but so far he is quiet about the matter of starting of MPhil and PhD classes in the Public Administration and Commerce departments. Dr. Khalid Iraqi is the Dean of faculty of Management & Administrative Sciences and he told that he would helped to start the programs of MPhil and PhD if he would be asked by the heads of the Commerce and Public Administration departments but he was not contacted by these persons about this matter. Dr. Shakeel is the Head of MPhil and PhD programs of Karachi University and he has the same view that the chairmen of business administration and commerce departments are not taking any interest for the commence of MPhil and PhD classes in their respective departments. This entry was posted in Admissions, Universities on April 30, 2015 by admin. The practical exams of matric science and general group (regular) under the Board of Secondary Education Karachi will be held from May 02 to 20, 2015. The examination schedule of additional papers, improvement of grade (part 1, 2 & combined) and candidates of other boards will be declared later while failed students of previous exams can attend the practical exams alongside fresh students of their schools. Principals of all the schools can take practical stuff by sending any senior teacher with the authority letter. This stuff can be taken through following schedule. 29th April 2015: Jamshed Town, Gulshan Iqbal, Gulberg, Liaquatabad, North Nazimabad and North Karachi. 30th April 2015: Gadap, Korangi, Landhi, Bin Qasim, Malir and Shah Faisal. 1st May 2015: Kemari, Lyari, Sadr, Orangi, Site and Baldia. 1st May 2015 is holiday but related examination centers will remain open that day. Official schedule of practical exams must be followed by all the schools. This entry was posted in Date Sheet on April 30, 2015 by admin. The B. Com part two and part 1&2 (composite) regular annual papers 2014 has been announced by the University of Karachi. Fayyaz s/o M Arif (roll no. 522342) of Govt. College of Commerce & Economics got the first position by getting 979 according to the result as well as Mehtab Karim d/o M Iqbal (roll no. 929315) of Govt. College of Commerce & Economics managed to achieve the second position by getting 977 marks while Ayesha Sikander d/o Sikander of DA Degree College for Women got the 3rd position by gaining 966 marks. This entry was posted in Universities on April 30, 2015 by admin. 7th May 2015 is the date of commencement of intermediate/ linguistics annual exams 2015, as notified by the Board of Intermediate & Secondary Education Multan. The related academic institutes will provide the roll number slips to the class 12/ composite regular students while they can download online roll number slips. On the other hand, roll no. slips have been dispatched to the private candidates on their mentioned addresses and they also have the facility to download roll number slips online. The roll no. slips of regular and private candidates with objections have not been sent by the board and they are also not downloadable. So if a candidate could not receive the slip and also could not download it then he should visit board’s office and clear his objections to be able to qualify for the papers. This entry was posted in BISE on April 29, 2015 by admin. Benazir Bhutto Shaheed University, Lyari has issued the B.Com part 1 (regular & private) exams 2014 results. According to BBSUL, there were total 7 papers in these exams while 487 students passed all the papers while the total number of students was 780. By visiting www.result2013.pk, you will be able to view complete results. This entry was posted in Results, Universities on April 29, 2015 by admin. University of Health Sciences has issued the MBBS 1st professional (part 2) supplementary exams results. According to results, the passing percentage remained 68.18% as 722 students passed and 286 failed out of total 1059 participants of 32 medical colleges. To view complete results, you can visit the site www.result2013.pk. Allama Iqbal Open University Islamabad announced roll no slips of ssc exams of autumn semester. 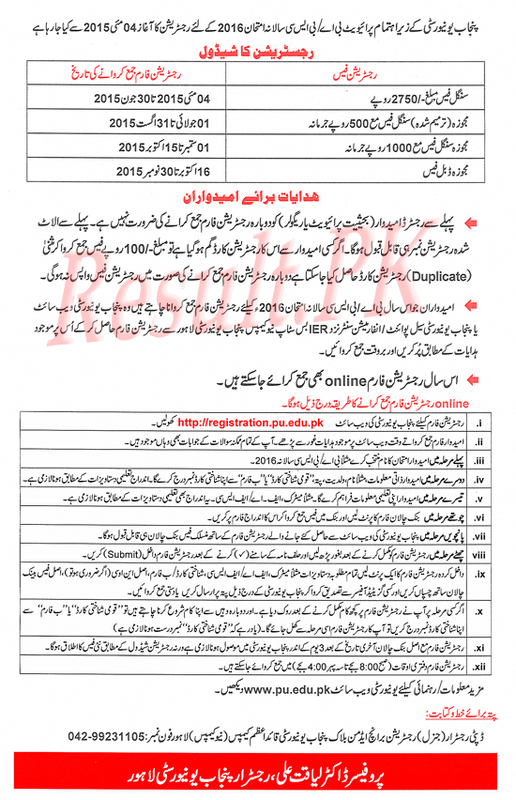 You can download your AIOU SSC roll on slips 2015 and date sheet will be updated here soon as university will issue. This entry was posted in Universities on April 28, 2015 by admin. University of The Punjab announced annual 2016 examination schedule of BA/BSC. From 4 May 2015 PU is going to start admission forms and fee receiving for 2016 annual exams. Punjab University introduced online admission from submission method this time and students can submit their BA BSC admissions forms online via PU website http://registration.pu.edu.pk. This entry was posted in Admissions, Universities on April 28, 2015 by admin. 306 examination centers has been established by the BISE Faisalabad in Faisalabad division. As the examination department mentioned, that 197 examination centers are in Faisalabad along with 45 in Toba Tek Sing, 44 in Jhang and 20 in Chiniot, and as well one center in the Central Jail. From 7th of May 2015 the HSSC part two papers are going to be started. Where 84000 participants are promised to be taking part, while the board of examination has declared the role number slips for the students. You can visit www.result.pk to get more details.